The President of the United States of America takes pride in presenting the Navy Cross (Posthumously) to Lieutenant Colonel Joseph Eugene Muir (MCSN: 0-49816), United States Marine Corps, for extraordinary heroism as Commanding Officer, Third Battalion, Third Marines, THIRD Marine Division (Reinforced), Fleet Marine Force, during Operation STARLITE in Quang Ngai Province, South Vietnam, from 18 to 24 August 1965. With utter disregard for his own safety, Colonel Muir fearlessly exposed himself to intense enemy fire while leading his battalion in assault against insurgent communist (Viet Cong) forces. Though fully cognizant of the danger, he repeatedly positioned himself in the midst of the violent action. Upon encountering strong enemy resistance, he joined the assault companies in front line positions to personally direct their advance, and succeeded in conquering two of the more strongly defended hostile areas, resulting in 215 confirmed enemy dead. Despite an almost complete lack of sleep for three days, his tireless application of professional principles provided a major contribution to the success of the Operation. Colonel Muir's valiant conduct, inspiring leadership, and courageous fighting spirit reflected great credit upon himself and the Marine Corps and upheld the highest traditions of the United States Naval Service. WASHINGTON, Oct. 5 (AP). - The Army trains its future officers at West Point but Cadet Joseph E. Muir, 2d, doesn't expect to be one. He wants to join the Marines and go to Vietnam -just as his father did. 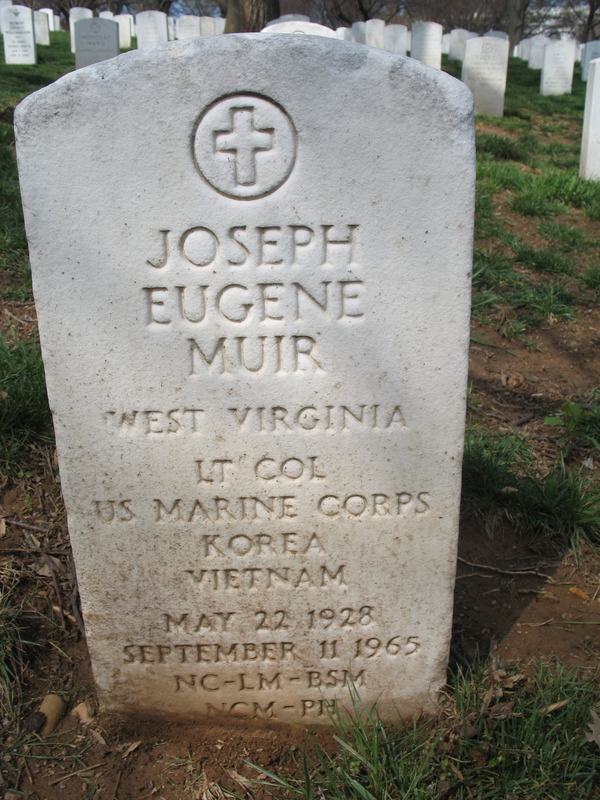 The youth's father, Lieutenant Colonel Joseph E. Muir, known as "Mr. Vietnam" to some of his fellow officers, posthumously was awarded a cluster of medals Wednesday for his role in a rout of two Vietcong regiments in a fierce August, 1965, battle near Da Nang. Colonel Muir's 18-year-old son stood at attention as Marine Commandant General Wallace M. Greene Jr., presented the Navy Cross, Bronze Star and Legion of Merit to his mother and the widow of the hero, Mrs. Mildred L. Muir. The Navy Cross is the Nation's second highest honor. Later the young cadet, blinking back tears, said he is planning "to go into the Corps" upon graduation from West Point. Despite his father's death, he said, "I still want to be a soldier or a Marine. I'm still convinced it is the best profession there is." As for service in Vietnam, "I want to go," he said. "I'm very, very, very proud of my father." leader of the 3d Battalion of the 3d Marine Division. He is the only Marine Battalion commander to die in Vietnam thus far. Colonel Muir won his medals for his role in directing the success of Operation Starlight, the 1965 battle that marked one of the first times U.S. forces entrapped and forced Vietcong regiments to stand up and take a beating.